Ergonomic handles fitted with a shock absorber minimise the kickback even when cutting thick branches, allowing you to work for hours without fatigue. This model is not the best option for people with small hands. Designed with an eye on details, the FELCO FEL 2 is recognised by professional gardeners and horticulturists worldwide as an outstanding example of exceptional quality. Built to last, these secateurs will consistently deliver clear cuts and become your best gardening companion for many years to come. A handle guard will securely protect your hand from cuts and scratches and easily get to hard-to-reach twigs and branches. A non-slip grip is only on one side of the handle. Featuring two cutting modes, these all-purpose secateurs will let you easily cut through both thick branches and more delicate and thinner stems. Simply choose a ratchet or a single cut mode with a quick-flick switch and you'll get the cutting job done with the minimum effort and in almost no time. Thanks to a special handle design and a central catch at the rear, this model will be suitable for left and right-handed users alike. It might seem a bit inconvenient for users with big hands. 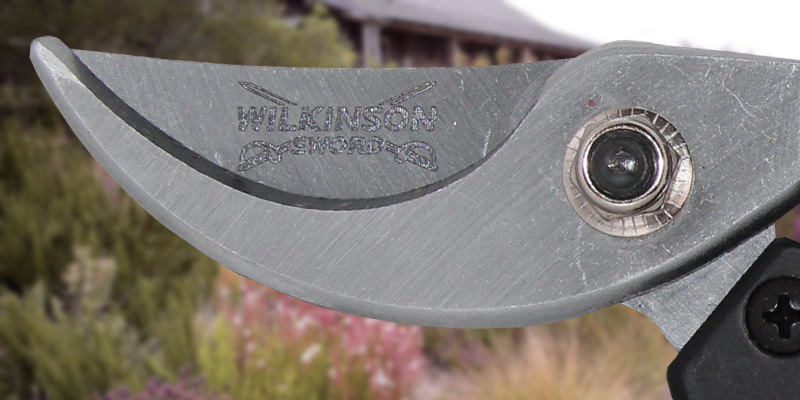 If you need a functional and affordable garden cutter, the Wilkinson Sword pruning shears are the right model to opt for. Distinguished by quality materials and well-thought design, these secateurs will make pruning an easy job and serve you for years. An all-steel construction contributes to overall durability and ensures a reliable tool performance no matter if you cut shrubs or flowers. A locking mechanism might allow for occasional blades opening. 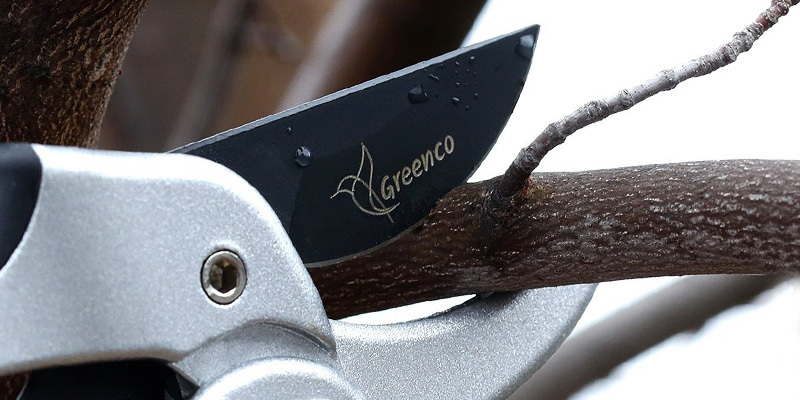 Owing to a modern ratcheting mechanism with a channel technology, the Greenco Gardening is a kind of a hybrid of the anvil and bypass pruners. The ratchet significantly reduces the stress on your hand and wrist while the channel technology will let you get precise clean cuts. The ILAG™ on the blades improves rust resistance, enhances antiseptic qualities, and prolongs the service life of steel blades. It's a perfect cutting tool for final trimming, finishing touch-ups and minor shaping. You can easily cut thin hedge branches, shrubs, and plant stems. Thanks to its ergonomic design, it will provide superior comfort while pruning for people with different hand sizes. Founded in 1945 as a small workshop with several workers, today Felco is a true leader in gardening tools production. 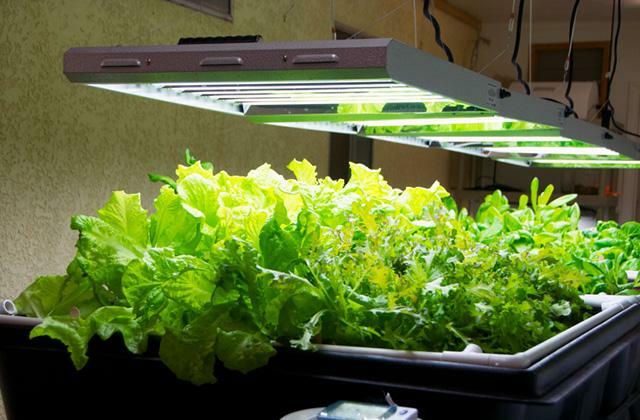 Applying advanced technologies, constantly integrating know-how into all stages of production process and searching for innovations, the manufacturer delivers consistent product quality valued by professional growers and home gardeners alike. The FEL 2 Original secateurs are a vivid example of exceptional Swiss quality created with close attention to details. For this model, Felco uses only the best available materials to ensure high cutting efficiency and unmatched durability of the tool. 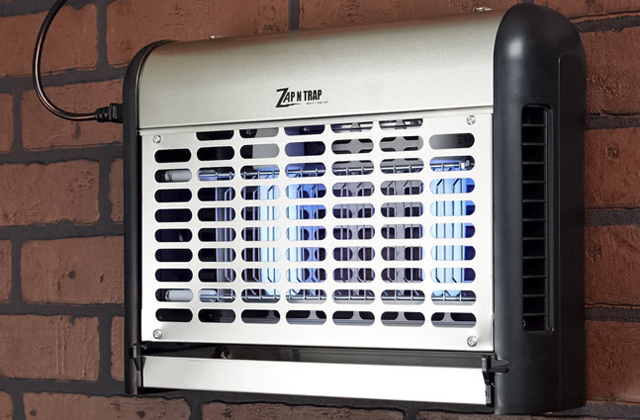 The blades are made of hardened steel and are easy to replace since they are not riveted. They are powerful enough to easily slice through dry and deadwood. Moreover, you can even cut wires, thanks to a special notch on one of the blades for inserting wires. It’s a distinguishing feature of Felco secateurs not found in other brands. All-forged aluminium handles are light yet strong and greatly contribute to the cutter’s reliable performance. Along with quality build, the FEL 2 stands out for the excellent cutting capacity. This model allows cutting stems and branches up to 25 mm in diameter. Meanwhile, a centre bolt and nut will let you manually adjust the play between the blades to make more precise cuts. Powerful and durable as they are, the FEL 2 secateurs cut through almost everything, be it a thick stalk, a young stem or even a metal wire that makes them one of the best secateurs for general use. In the Felco FEL 2 hand pruners, an all-metal design ensuring faultless day-to-day performance and long service life is cleverly combined with exceptional convenience features. See for yourself. How often do you find your garden shears with the blades stuck together? To prevent this, Felco fitted one of the blades with a sap groove that will help remove the sap debris when cutting juicy stems and flowers. Aluminum handles are ergonomically shaped to fit different palm sizes. A non-slip rubber coating on the handles will ensure a secure and comfortable grip while a cushion shock absorber will provide smooth working and soft closing and reduce the strain on your hand and wrist. For added user safety and protection, the pruners feature a safety catch that will keep the secateurs closed when not in use. 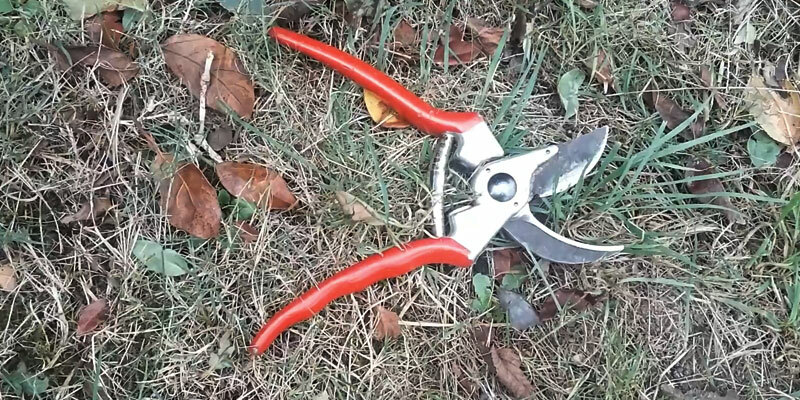 Many gardeners lose their pruning shears while trimming shaggy shrubs or large flowerbeds and eventually cannot find them. This won’t be a problem for you, thanks to a branded Felco crimson colour handles that make secateurs straightforward to come across. If you need a well-balanced, dependable and easy-to-use tool that will faithfully serve you for years, the Felco FEL2 is the right model to opt for. When it comes to choosing a hand tool, convenience of use and high-quality build are the top priorities. 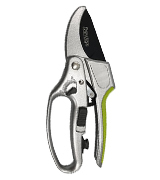 This is exactly what you will get with the Davaon DN -3130-3B hand pruner. Like many other Davaon garden tools, this model offers a number of features that will make even the most demanding pruning jobs much easier. The first thing you will like about these secateurs is an ergonomic comfortable design suitable for both right-handers and left-handers, ensuring convenience of use and high-performance characteristics you’d expect for a quality tool. A strong body and handles made of aluminium are lightweight and easy to hold, reducing strain and allowing you to work for hours without fatigue. The upper handle features a soft non-slip coating for comfier and more secure grip while a lower looped handle provides better control and protects your fingers from occasional cuts during work. Another benefit of this model is its solid ultra-sharp blades. Made of premium SK5 carbon steel, they are less likely to nick and do not need frequent sharpening. On top of that, the blades feature a non-stick Teflon coating resisting any sticky materials. Besides, the tool comes complete with an oil sponge to keep the blades clean and properly lubricated. All of this greatly prolongs the tool service life and ensures precise pruning and trimming. Made of premium-class materials and designed with user comfort in mind, the Davaon secateurs are definitely built to last and consistently deliver more enjoyable clipping experience. 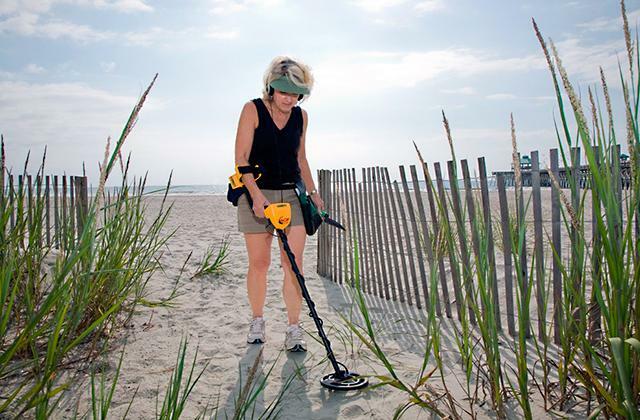 Many horticulturists tend to purchase different tools for light and heavy-duty applications. Forget it! 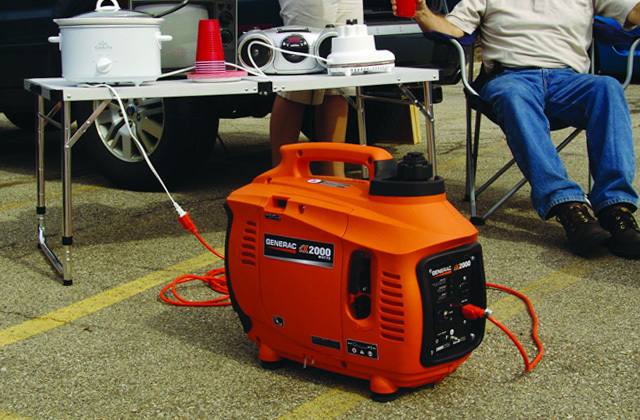 With the Davaon DN-3130-3B, you will get it all in one tool. 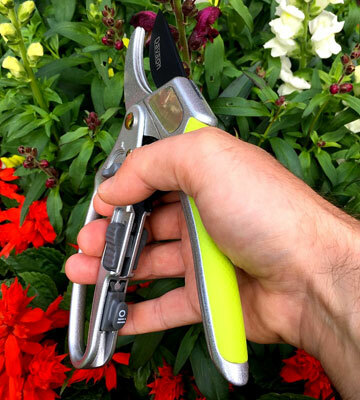 This model offers two cutting modes smartly incorporating the best functions of conventional single-cut secateurs for more delicate works and more forceful ratchet pruners for heavier jobs. In a single cut mode, you can make quick precise and clear cuts to trim slender stems and twigs up to 18 mm in diameter. It’s a great option for cutting flowers, biennial plants, leaves, young twigs and springs. A ratchet mode, on the other hand, provides a 4 short-cut ratcheting action that works great for thicker branches up to 22 mm. 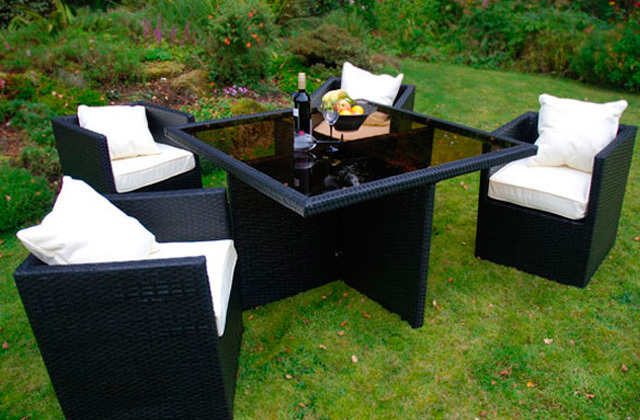 It will be of use when you need to cut woody stems of perennials, dry branches and deadwood. A new ratcheting mechanism with a handy switch will not only let you conveniently and quickly switch between two modes but also add extra power saving your effort on cutting. 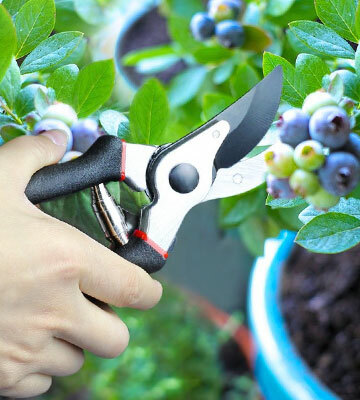 Boasting the expanded functionality, the pruning shears from Davaon will help you save your budget on buying several tools and cater to a variety of your gardening tasks. Wonder if you can get a handy and functional tool for light-duty pruning jobs at an affordable price? The Wilkinson Sword secateurs are exactly what you need. 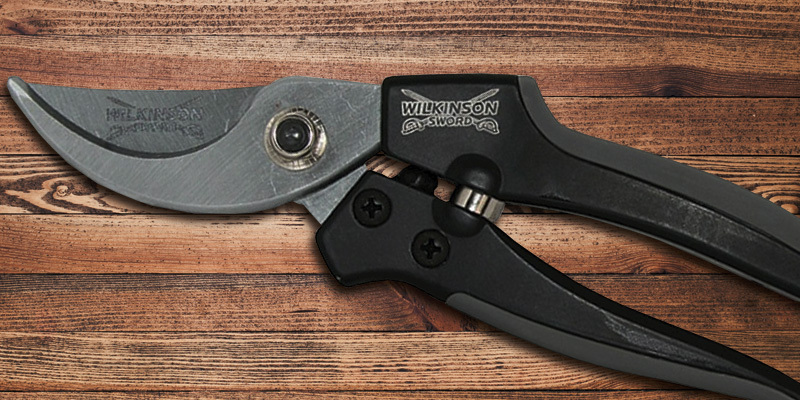 At a fraction of the cost of more expensive pruners, this tool offers dependable design, reliable performance, and usability of premium cutters. The model belongs to a bypass type of pruners fitted with a single-edged curved blade that passes by a thicker unsharpened blade. The blades provide scissor-like cutting action delivering neat close cuts. It’s a perfect option for trimming younger growth like new springs on green hedges and fences of bindweeds, cutting flowers, and shaping shrubberies. The blades are made of first-class carbon steel and are covered with the non-stick coating for superior cutting performance. To keep them sharp and clean, simply oil the blades from time to time. Since the Wilkinson Sword secateurs are designed for delicate cutting jobs that do not require much pressure, the body is made of aluminium making the tool lightweight and easy to handle. Soft rubber inserts on ergonomic handles add comfort and convenience during work while a quick-to-open safety catch makes the tool suitable for both left-handed and right-handed users. If you look for a perfect balance of price and high-quality build, the Wilkinson Sword secateurs are the right model to opt for. Wilkinson Sword is another renowned brand in the area of garden and lawn care tools. The manufacturer produces everything from loppers, pruners, axes, and scissors to lawn edgers, grass shears and tree cutting tools. What sets the company among other popular gardening tools producers is a long tradition of making exceptional-quality tools at an affordable price. You would ask how did they manage to achieve this? The answer is the best materials and fine workmanship backed up by more than two centuries of experience. Started in 1772 in London as a company manufacturing swords and guns, over years, the Wilkinson Sword has tailored its craftsmanship to perfection and applied its approach to producing only high-quality products in garden tools production. Today, the range of stainless steel and carbon steel garden tools reflects the company’s heritage. When it comes to Wilkinson Sword, it’s not about price, it’s always about cutting excellence. No need to say that tools for commercial or professional use are always high-quality products made of premium class materials and usually designed to withstand rigorous day to day performance. Whether it is hair styling, facial care, house cleaning or gardening, it should start with top-quality tools. And no matter, if horticulture is your major occupation or your hobby, the right tools will improve your chances to success and let you be sure about the final results. The Greenco secateurs is exactly that kind of a tool when it comes to pruning and trimming tasks. 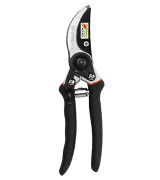 This model is a professional-grade pair of secateurs designed to take the strain off out of your plant clipping jobs. 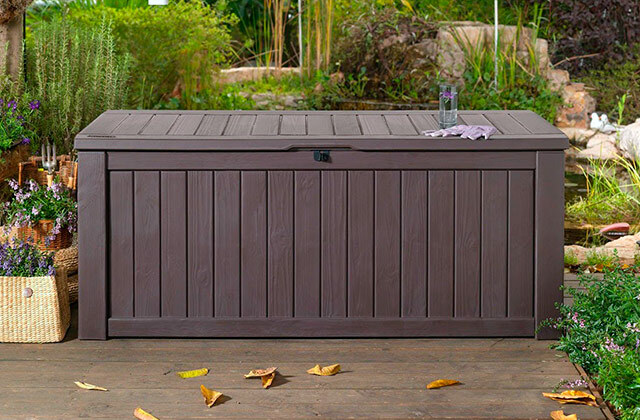 A hardened stainless steel body is solid and durable ensuring prolonged service life under frequent use. The anvil blade of high carbon steel has a non-stick coating and will stay sharp for longer meeting the most demanding cutting needs. The ergonomic handles offer a comfortable grip for right-handed and left-handed users alike. 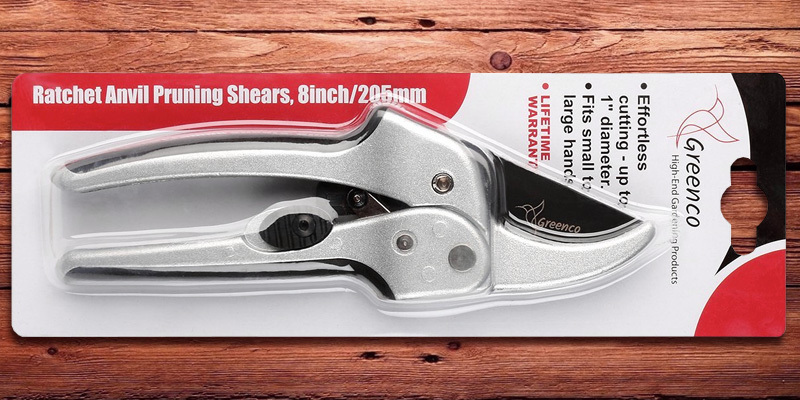 Thanks to a high locking mechanism greatly reducing the strain on wrists, these shears are a real find for those gardeners who do a lot of pruning or have weak hands. A double-sided safety lock will keep the blades securely closed when the tool is not in use. Created with a user in mind, the Greenco secateurs will become the best friend of any professional or home gardener, landscaper or horticulturist. Anvil or bypass secateurs? The answer is a hybrid design that combines the best features of both types. This solution is embodied in the Greenco garden pruners. Instead of using a spring to open and close the blades, this model comes fitted with a ratcheting mechanism that assists cutting by maximizing the leverage for increased pruning power and reducing the user effort almost to 50%. At the same time, in the centre of the ratchet, there is a channel that promotes more precise and cleaner cuts like those made by bypass pruning shears. Thanks to a hybrid technology, the Grenco pruners can easily cut through dry branches and twigs, thick roots and deadwood or juicy young stems and flowers that make this model perfect for both heavy and light applications. 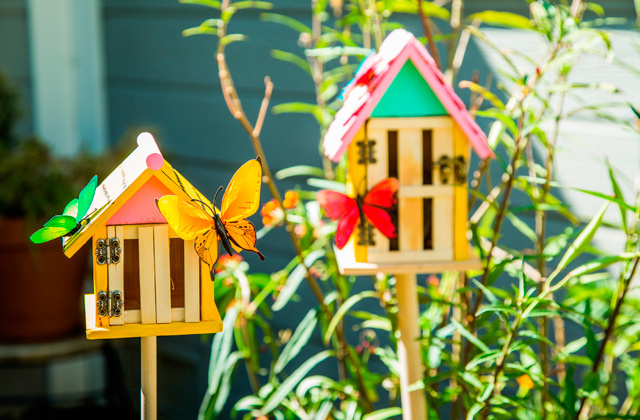 Gardening involves a great variety of cutting tasks, from cutting thick tree limbs and branches to shaping shrubs and clipping flower beds, with each job requiring a different kind of garden tools to get the best cutting results. When it comes to light pruning and clipping tasks, the SHANE HAI UK201-BS01-1 secateurs will become the best friend of any professional gardener or an amateur horticulturist. These bypass pruning shears come with the SK5 carbon steel blade that stands out for high strength and sharpness. 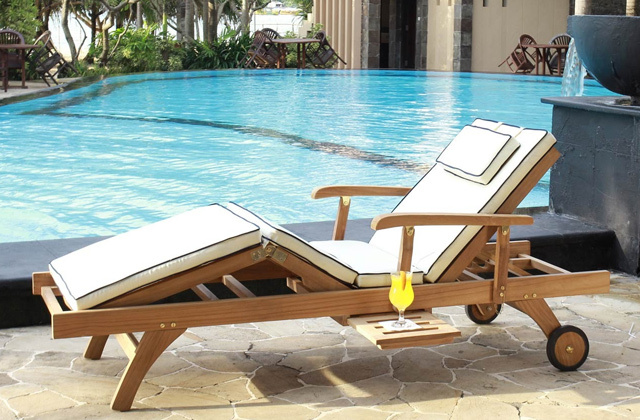 Meanwhile, the branded ILAFLON Resist ILAG coating ensures exceptional rust resistance, excellent antiseptic and antibacterial qualities for longer life use. The handles of a forged aluminium alloy are solid yet lightweight for fatigue-free operation. Besides, soft plastic overlays provide a comfortable and secure non-slip grip and a shock absorber system adds convenience when cuttings since it reduces stress on your hand and wrist. 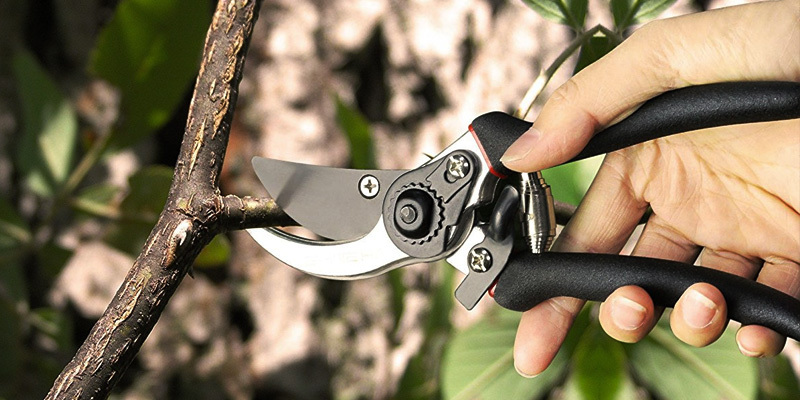 Featuring an ergonomic easy-to-use design and razor-sharp blade, the SHINE HAI secateurs can cut twigs, plants stems, and spring up to 12 mm in diameter. 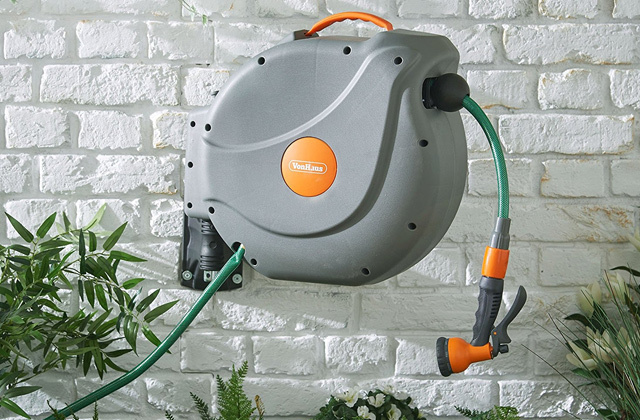 With such cutting capacity, this model is particularly useful for trimming and shaping some small hedges and shrubs as well as for final touch-ups on flowers or vines. On top of that, the blade has a wire cutting groove allowing you to cut smaller gauge wires if needed. If you need a handy little helper to make your light pruning jobs almost effortless, the SHINE HAI secateurs will definitely find their place in your tool shed. 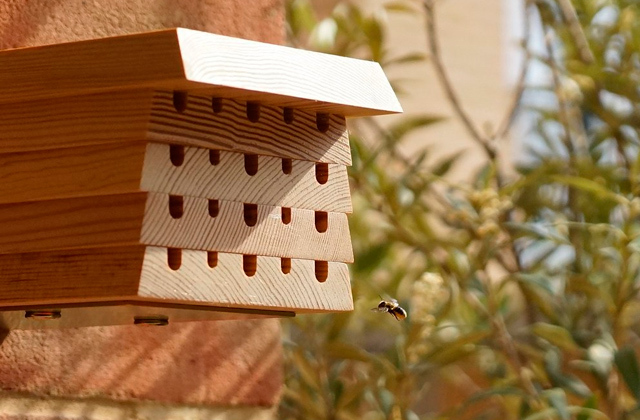 Along with some basic tools that no gardener can do without, there is a couple of helpful items that further facilitate your garden work and sometimes might become real lifesavers. A holster clipped to your belt will help you keep all your tools always at hand and prevent you from losing them. A Hori Hori or soil knife will be of great use when you need to cut weeds or roots, transplant or remove plants, and cut the sod. Thanks to a long concave blade, this knife is ideal for digging and prying. During a harvesting season, a fruit picker pole will let you pluck fruit from tall trees with ease without using a ladder. Get a hand-held hula hoe to combat weeds in tight garden spaces and raised beds. 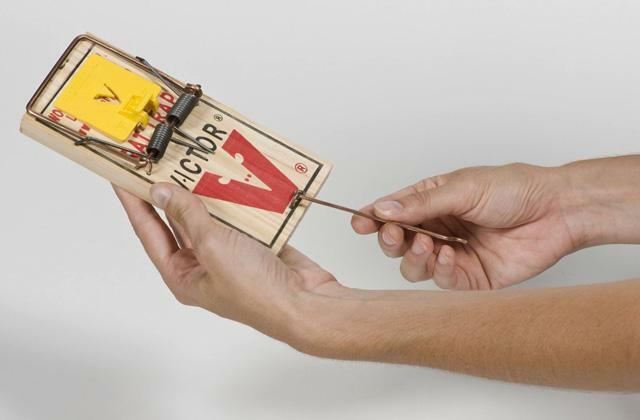 This simple device allows cutting weeds at their roots. A broad fork is an indispensable tool to easily prepare an appropriate bed for planting. Secateurs, also called pruners or pruning shears, are a type of scissors used to cut plants. It’s a must-have cutting tool for any professional landscaper or home gardener to correct the vegetation outgrowth. 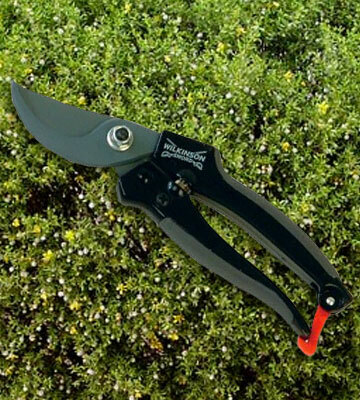 Used for pruning and trimming shrubs, trees, vines, and flowers, secateurs help maintain plants health. Unlike loopers or most powered pruning tools, hand pruners are designed for precise pruning and light-duty applications delivering clean cuts on smaller twigs, usually no more than 2 centimeters in diameter. Hence, it’s a common tool for different horticultural areas. 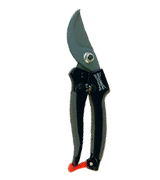 However, secateurs come in a variety of types, sizes, and designs and do not work in the same way. 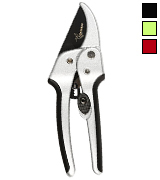 It might be hard to define which secateurs are the best. Below, we’ve compared the best garden secateurs to help you find out which secateurs are the best, what secateurs are used for, and choose a comfortable pair of pruning shears suitable for your cutting jobs. Yet, if you need to cut thick branches and limbs, tackle deadwood on height, shape trees or quickly make a clear cut or even edge on a green fence around your yard, it'll be better for you to opt for a pole chainsaw or a hedge trimmer. There are two major types of secateurs created for different cutting jobs. Bypass secateurs work just like common scissors with one blade slipping underneath the other. Such design ensures close and even cutting action causing minimum damage to the stems. This type of garden shears is a great choice for precise pruning and general use. Long blades easily get into tight spaces making the tool suitable for pruning side stems flush with the main ones, removing bulbs, and maintaining beautiful flowerbeds. A cutting principle of anvil pruners resembles that of a knife cutting on a chopping board. A sharpened on both sides upper blade cuts against a flat bottom plate. Anvil secateurs are perfect for cutting thick woody twigs and branches. 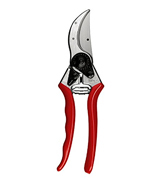 Secateurs cutting capacity is defined by the branch diameter you can cut through. It depends on the distance between the blades that usually does not exceed 20-25 mm. However, it is necessary to take into account the hardness of the stem or plant you are going to cut and the user strength. Thus, you might be able to cut 20 mm young stems with ease while dry pine twigs of the same diameter will appear hard to tackle with pruners. A rotating handle or a central catch that makes shears convenient to use both by right-handers and left-handers. An overall tool size that will perfectly suit your hand. A locking mechanism that will keep the blades closed when not in use protecting your hands from occasional cuts. A ratchet mechanism (most often found on anvil pruners) that enhances the cutting force and makes pruning large and thick branches an easy job. Loppers. 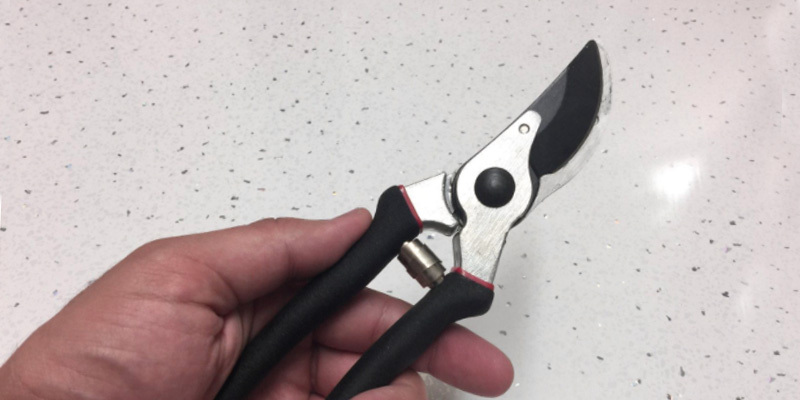 Looking very much like pruning shears, they work great for thick branches from 25mm to 36mm in diameter and are especially good for fruit trees and vines. A pruning saw for really thick dry branches, limbs, and deadwood. A hedge trimmer to take care of hedges, evergreens, shrubs, and perennials. A pole chainsaw to tackle tree branches at the height of 2.5m and higher. Instead of a file, use a carbide sharpening tool. A carbide blade is stronger and you’ll get the pruner sharpened in several strokes. It’s better to sharpen the blade before it gets completely dull since an extremely blunt blade can chip, roll or get damaged and as a result be not subject to repair. Try to maintain the factory angle on the cutting edge to keep the bevel. Never sharpen toward the blade. A bypass blade requires sharpening only on one side while an anvil blade should be sharpened on both sides. After sharpening, oil the entire blade to prevent rusting. Always clean your garden secateurs after use and regularly oil them to avoid rust and preserve their cutting efficiency. 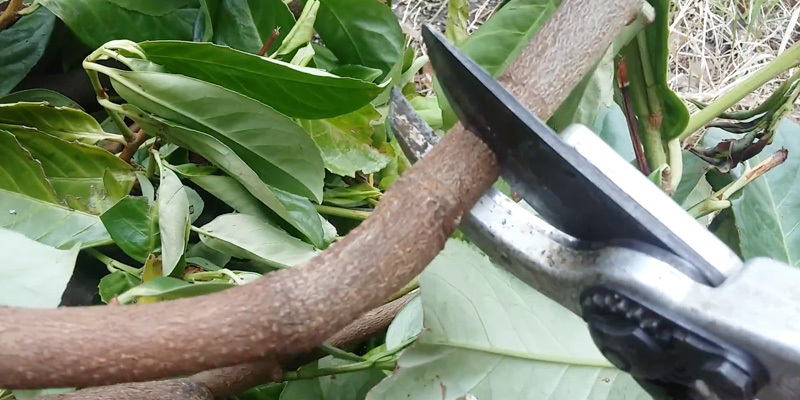 Always use the pruning tool with a cutting capacity meeting the branch diameter. Use only sharp tools that deliver precise clean cuts without smashing the plant. If you prune a tree, never cut branches in flush with the trunk or limb to prevent collar removal. Hold bypass secateurs with a hooked side of the blade away from the plant to avoid plant crushing damage. Avoid applying snip-snip action like that of scissors and always get the wood deep into the secateurs to make a close cut. If you are not sure what branches to cut start with dead, broken, and diseased branches or those growing toward the centre of the plant. The best time for pruning is the late winter and early spring before the plants put on a new growth. Avoid pruning evergreens when the temperature is below zero and never prune walnut, birch, and maple before they leaf out. However, when it comes to light pruning, you can remove dead, weak or broken branches any time. Q: Do I really need secateurs? A: Today, a pruner is a must-have tool for any gardener, be it a professional or an amateur. For almost two centuries, this hand tool has been used for cutting tree branches to encourage growth, combat invasive barbs, shape shrubberies or arrange flowerbeds. You’ll hardly be able to cut through woody stems and thick twigs with common scissors or make precise clean cuts with a saw. 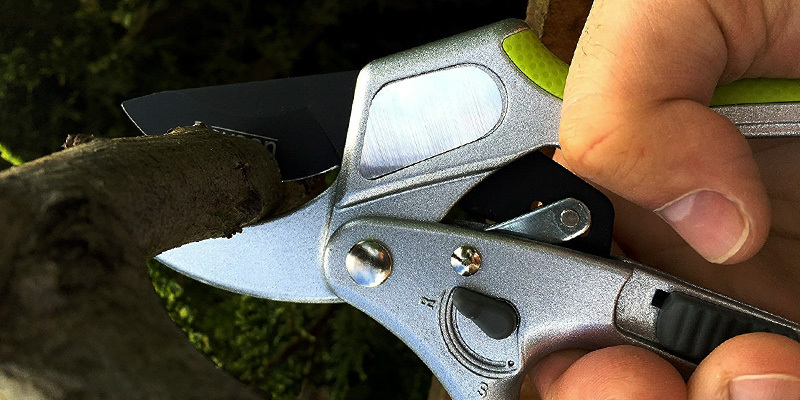 Hence, when it comes to precise pruning and light trimming or finishing tasks, garden secateurs are the right tool to have. Q: What is the difference between loppers and secateurs? A: Using pretty much the same cutting principle, loppers and pruning shears are not the same. Loppers are operated by two hands and are meant for pruning thicker limbs and branches while secateurs are designed for lighter applications on young stems, springs, and flowers. 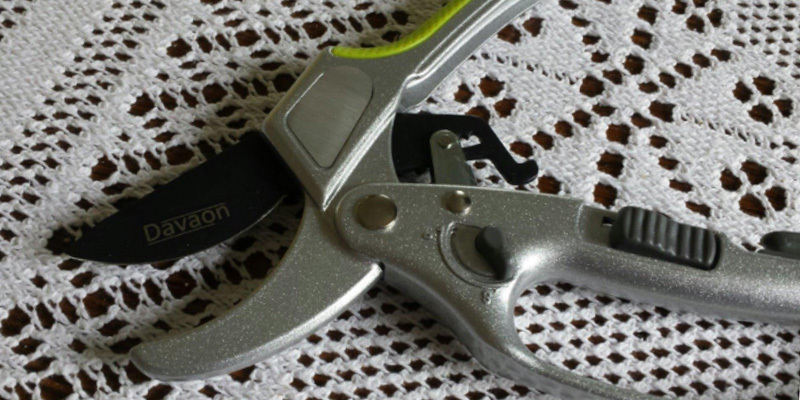 Q: What are the main cutting jobs I can do with secateurs? A: Secateurs are designed only for cutting plants. Depending on the cutting capacity of a certain model, it can be tree and shrub branches and deadwood or juicy stems and young sprigs. There are some models that also boast an option of cutting wires, thanks to a special groove on the blade. Yet, normally, these are thinner and smaller wires, not thick metal rods. It is not recommended using pruners to cut metal sheets or some other hard materials since they might get damaged and go blunt. Q: How to sharpen secateurs? A: As soon as you notice that your secateurs do not cut cleanly and it takes you much more effort to make a cut, it means, the blades require sharpening. The best way to sharpen the blades is to use a special sharpener or a sharpening stone. However, if the blades are damaged or worn, you’d better replace them. 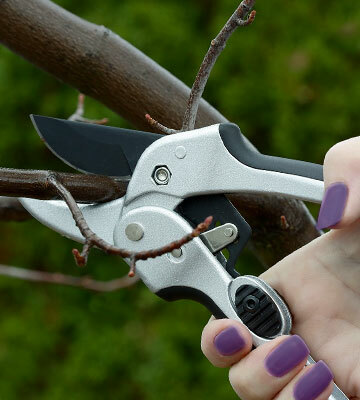 Q: Are there pruning shears for painful or weak hands? A: The best option for people with a weak grip is ratchet secateurs and lightweight models with a looped handle that normally require less effort to hold and less force to operate. Q: I constantly lose my pruners in the garden. What can I do about it? A: If you keep losing your secateurs, choose models with easy-to-see bright handles or a small loop on the handle to attach the tool to your belt, or simply buy a holster to keep your garden scissors at hand. Q: How can I prolong the service life of my garden shears? A: To keep your tool in an operating condition longer, the appropriate maintenance is required. Apart from sharpening the blade on a regular basis, rub your secateurs with an oily cloth after every clipping session to clean off the sap from the blades and prevent rusting. If you worked with diseased plants, do not forget to disinfect your secateurs with alcohol and oil them afterwards to keep the moving parts lubricated. Avoid using the pruners to cut branches thicker than the tool’s cutting capacity, since this can damage the tool or even break it. 1. Pruning Shears, Wikipedia. September 13, 2017. 2. Secateurs, Appropedia. January 26, 2016. 3. How to buy the best secateurs, Which? 4. Jonathan Landsman How To Use Hand Pruners (Secateurs), The Spruce. April 04, 2017. 5. 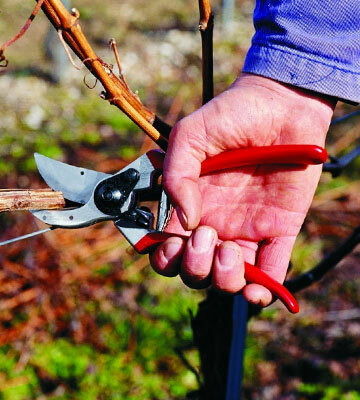 How to maintain secateurs, The Gardener’s World. 6. Joan Morris Need help with pruning? Start with the right tools, The Mercury News. July 13, 2017. 7. John Kelsey Choosing and Using Pruners and Loppers, This Old House. 8. Chris Barnes Secateurs buying guide, Choice. March 03, 2017.